In 1879, the Lime Creek Fire burned 26,000 acres of forest. A stalwart scorched tree has stood over 130 years. Linger for a captivating view of Engineer Mountain and the La Plata Mountains. 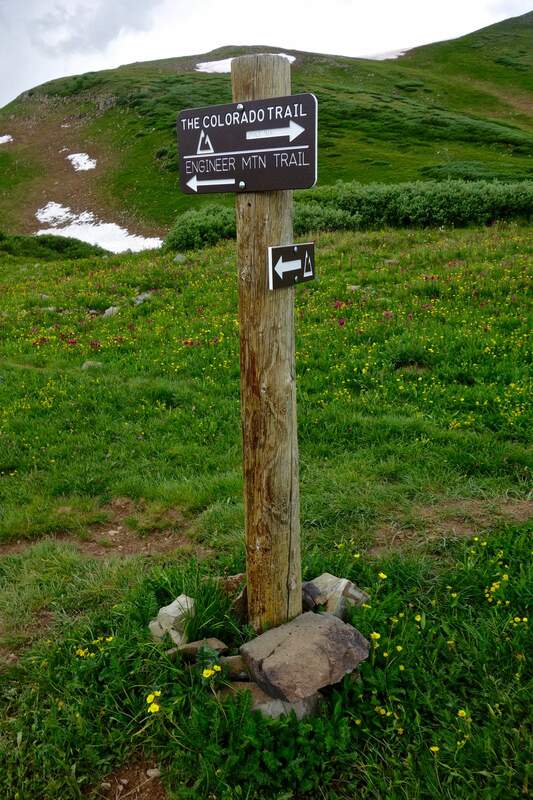 The trek begins on the Colorado Trail near Molas Pass and makes an arc westward and then south to the Pass Creek Trail, concluding at Coal Bank Pass. Track above the Lime Creek drainage to the Engineer Mountain Trail. 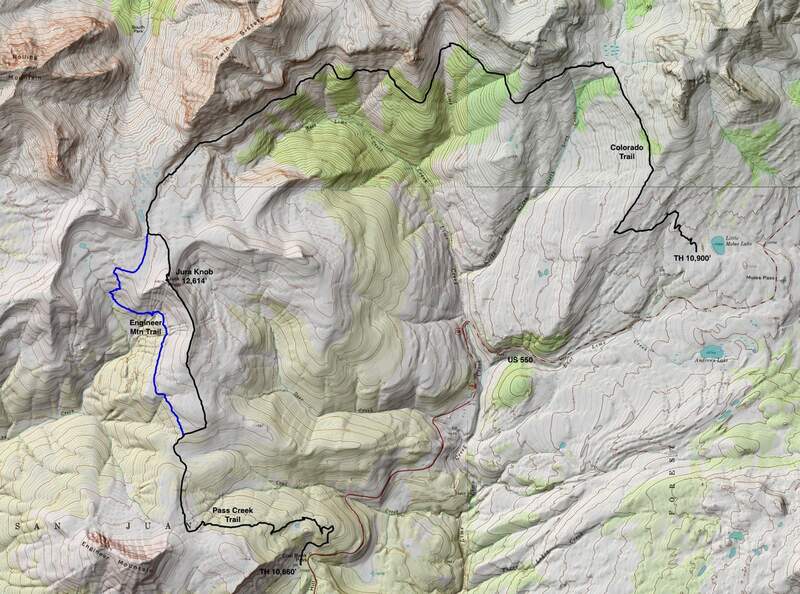 Off-trail climb Jura Knob, or remain on the Engineer Mountain Trail, the blue-line option. The trail system from Molas Pass to Coal Bank Pass, closed during the 416 Fire, reopened with celebratory fanfare. Cross-state hikers on the Colorado Trail are now completing journeys from Denver to Durango, and local mountain bikers are joyriding this gorgeous segment. 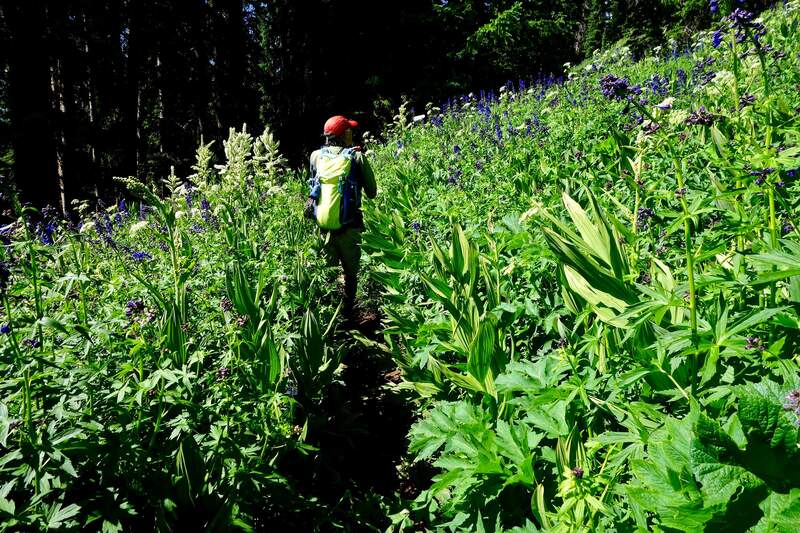 The reopening coincides with peak wildflower season in the high country. From the first to the last footfall, this 16-mile thru-hike is an immersive floral extravaganza, and the show is happening right now. The miles are long, but trail walking is fast and easy. The trek begins on the Colorado Trail near Little Molas Lake, elevation 10,900 feet, and makes an arc westward and then south to the Pass Creek Trail, finishing on Coal Bank Pass. For those who feel it is not a hike unless there is a climb involved, leave the trail and short-cut over Jura Knob. One tricky downclimb limits this option to experienced scramblers. Trust me, your dog can’t make the move. Colorado TrailHit the trail on the west side of the parking lot and enter a shaded big-tree wood. Myrtle blueberry, heart leaf arnica and Jacob’s ladder lavishly decorate the forest floor. Climbing gently, step up limestone bands and break out into the high open on a ridge at 1.3 miles, 11,300 feet. In 1879, the Lime Creek fire burned 26,000 acres of forest with such intensity it has not yet recovered. A stalwart scorched tree has stood more than 130 years. Linger for a captivating view of Engineer Mountain and the La Plata Mountains. The trail hooks northeast up the broad ridge before veering west to flank West Turkshead Peak. For the next five miles, the Colorado Trail cruises along on the 11,600 foot contour. Hikers move along a linear path hovering at treelimit. 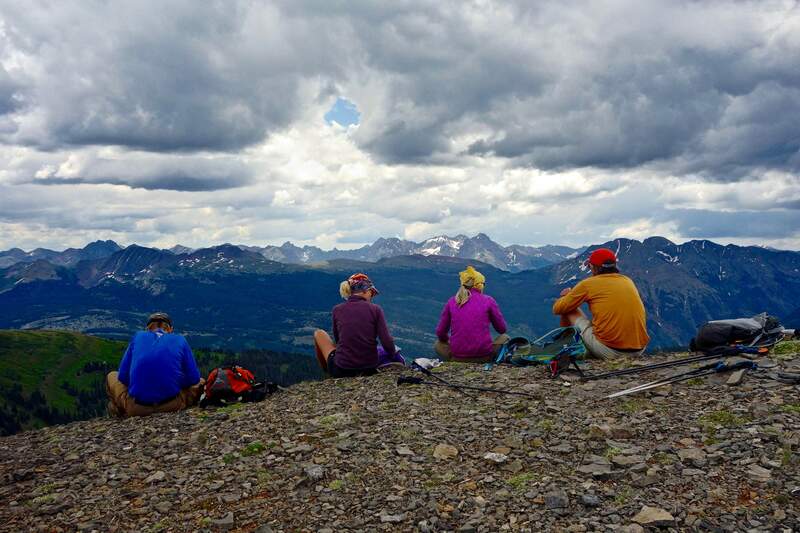 The trek is a complimentary interplay of forest, tundra, boulders and wildflowers. Back in the timber, Whipple’s penstemon, western valerian, and variegated paintbrush thrive in sunny patches. The track turns west and crosses a divide. The North Fork of Lime Creek surrenders to the south, and Bear Creek rolls north to its confluence with the South Fork of Mineral Creek. Pass by impressive conglomerate boulders embedded in tundra that peeled off the cliffs above. The Cutler Formation records the unroofing of the Rockies; it is named for outcrops near the mouth of Cutler Creek north of Ouray. Laid during the Permian age 252 to 298 million years ago, the red color comes from iron-oxide compounds deposited with the sand and mud. At five miles, a secondary trail veers north. It takes advantage of a fault in the Cutler to pierce the break at the apex of the Lime Creek drainage. Twice in this location I have encountered a substantial herd of sheep and barking white guard dogs. After crossing the headwaters of Lime Creek, the track curves around to the southwest. Along this stretch, flowers dwarf humans and hillsides are enveloped in osha, delphinium and corn husk lily. A small basin filled with jumbo boulders marks another fault in the Cutler Formation at 7.3 miles. Now the trail climbs gently and consistently through the krummholz and into the luculent high alpine. Multiple lakelets reside on a perched water table and streams glide lazily through tundra sparkling with marsh marigolds. Just off the bench, the sizable local elk herd grazes unaware of hikers above. Engineer Mountain TrailArrive at the junction of the Colorado Trail and Engineer Mountain Trail (EMT) at 9.4 miles. The Colorado Trail goes west, north of Point 12,766’. Leave the Colorado Trail here and turn south on the EMT. To reach Coal Bank Pass hikers transition from the Colorado Trail to the Engineer Mountain Trail. This junction is located in the high alpine. 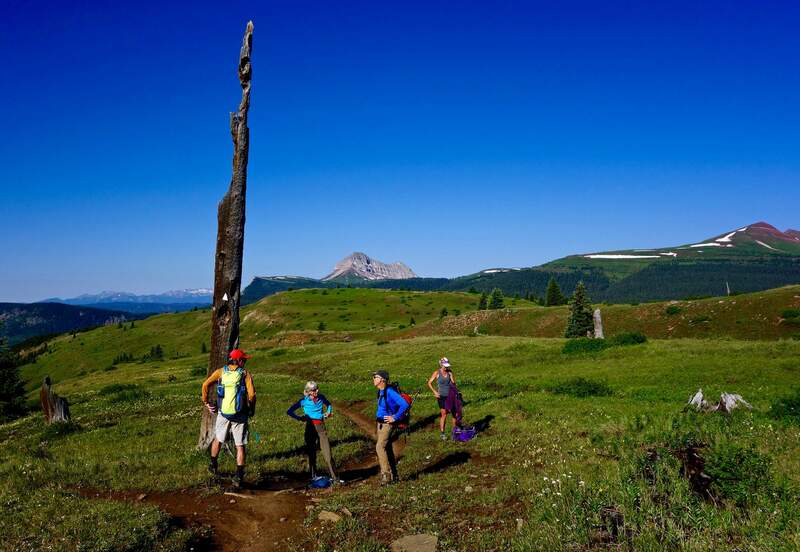 Trail hikers will be descending 700 feet into the headwaters of Engine Creek flanking Jura Knob on the west before climbing back up to meet the Deer Creek Trail in three miles where the routes rejoin. If the up-climb seems arduous, perhaps the fields of blue bells, rosy paintbrush and king’s crown will distract. Jura Knob optional climbClimb solitary Jura Knob to be surrounded by big mountains and a bigger sky. Walk south for just 0.2 mile on the EMT. At elevation 12,200 feet, leave the trail to climb the north ridge of Jura. The pitch is gentle to start and somewhat steeper near the top. Locate a good social trail though broken limestone and summit the flat broad crest at 10.2 miles. Jura Knob, elevation 12,614 feet, isn’t the tallest mountain around, but its singular location affords a sweeping vista of loftier peaks. Looking north is Rolling Mountain, the Ice Lake series and Twin Sisters. Eastward, the enchanting Grenadier Range and Needle Mountains are protected within the Weminuche Wilderness. From Jura Knob, the route heads toward the eastern slopes of crenelated Engineer Mountain. Looking eastward from the summit of Jura Knob, the enchanting Grenadier Range and Needle Mountains are protected within the Weminuche Wilderness. Descend on Jura’s south ridge. A delightful block scramble terminates at Corner Wall, a seven-foot downclimb located on the east side of the prominence. This is the easiest attack point. Scramble down Corner Wall facing the rock. Shorter people may need a spot because, while handholds are good, footholds are stingy and there is some exposure. Stay on the soft ridgecrest to a knoll at 12,000 feet. Then drop south 200 feet to intersect the Deer Creek Trail and head west. Shortly, reach the signed junction with the EMT and turn south. Cross yet another expansive flower-infused meadow and enter a rich stand of conifers. Pass Creek TrailThe trail climbs lazily onto the Engineer Plateau where the flower show is superlative. Indian paintbrush and orange sneezeweed are thickly packed, wild and free. Leave the EMT and go left onto the signed Pass Creek Trail. Mid-summer, flowers dwarf humans. Hillsides are enveloped in osha, delphinium and corn husk lily. From here, the trailhead is 2.4 miles down a well-engineered and rightfully loved trail. The pleasant grade proceeds by sinuous switchbacks. The dirt path is guarded by old and stately fir and spruce trees; limestone boulders are studded with fossils. One mile from the trailhead pass, a perfectly round disk of water. 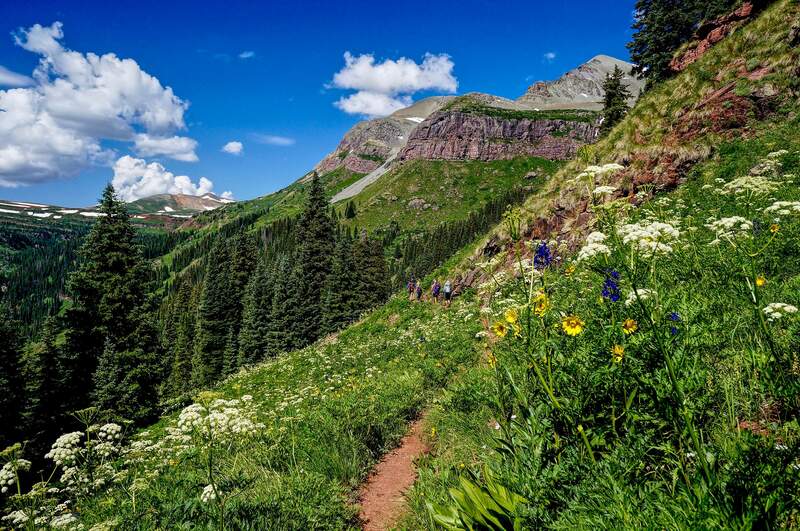 As you take your final steps toward the conclusion of this trek at Coal Bank Pass, you will be engulfed by some of the brightest and tallest wildflowers in Colorado. http://debravanwinegarden.blogspot.com. Debra Van Winegarden is an explorer and freelance writer who lives in Durango. Travel: The thru-hike requires a shuttle. From Durango, drive north on U.S. Highway 550 for 35 miles to Coal Bank Pass. Turn west just north of the pass onto a dirt road that leads to parking for the Pass Creek Trail. Drop a vehicle here and continue north on U.S. Highway 550. Crest Molas Pass and take the first signed left toward Little Molas Lake, 0.4 mile north of the pass. Drive 1.1 miles on a good dirt road passing an established campground and park at the Colorado Trail Trailhead. Pit toilet, no water. Distance and Elevation Gain: If you climb Jura Knob: 15.6 miles with 2,600 feet of climbing. If you forego Jura and stay on the Engineer Mountain Trail: 16.2 miles with 2,700 feet of vertical. High country an enticing allure, but are people prepared?